Steven Jones is a Technology Director at Amazon Web Services (AWS). The aspect I enjoy most about working at Amazon Web Services (AWS) is the opportunity to get to work closely with customers as they develop and pursue their individual migration strategies for moving mission-critical workloads to the AWS Cloud. Most importantly, it’s these types of conversations that drive our roadmap. In May 2016, we announced the availability of our x1.32xlarge instance type with 2 TB of RAM, purpose-built for running large-scale SAP HANA deployments in the AWS Cloud. In August 2016, we announced SAP certification and support for large, scale-out HANA clusters up to 7 nodes or 14 TB of RAM. This was followed by the addition of our x1.16xlarge instance type with 1 TB of RAM in October 2016. Back in May of this year, we announced our x1e.32xlarge instance type with 4 TB of RAM for deployments that needed a lot of RAM in a single system, SAP support for very large HANA scale-out clusters of 17 nodes or 34 TB of RAM, and a roadmap for 2018 with plans to support even larger Amazon Elastic Compute Cloud (Amazon EC2) instances with RAM between 8 TB and 16 TB of memory. We continue to work to support additional deployment options for SAP workloads and have a couple of updates. We released five smaller X1e sizes earlier this month. These additional instance types are now available and certified for SAP NetWeaver on anyDB deployments (SQL Server, Oracle, IBM DB2, etc.). With a high ratio of memory to CPU, these X1e sizes offer a great choice for database instances. 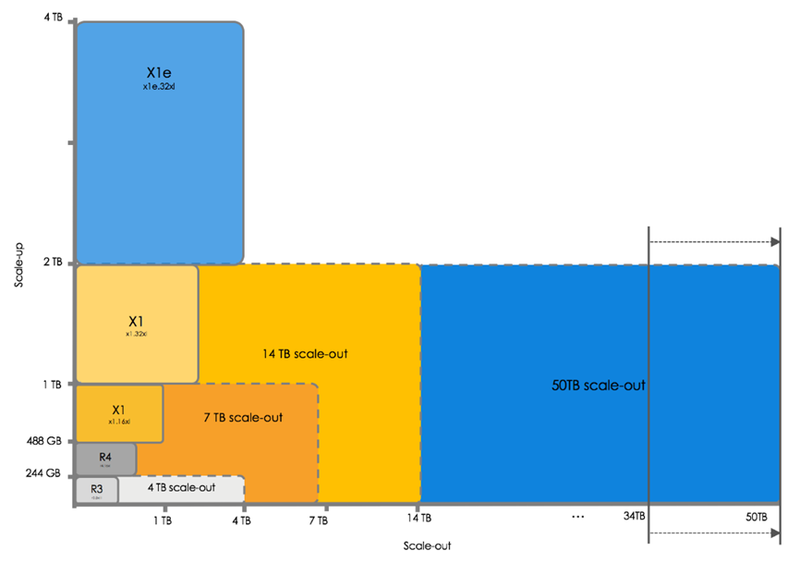 And today, I’m pleased to announce that SAP has extended certification for even larger SAP HANA scale-out clusters on X1 instances, leveraging up to 25 x1.32xlarge nodes or 50 TB of RAM. Certification details can be found in the SAP Certified and Supported SAP HANA Hardware Directory. In conjunction with this extension, on November 9, 2017, SAP certified our World Record results for the SAP Business Warehouse (BW) Edition for SAP HANA Standard Application Benchmark version 2 executed in the cloud deployment type. * With a dataset of 46.8 billion initial records, this is the largest benchmark of its type as of November 27, 2017, and far exceeds the high-water mark in data volume by an order of magnitude. Our setup comprised 25 x1.32xlarge (2-TB) instances running the SAP HANA database, and demonstrates the unparalleled scalability and agility of the Amazon EC2 platform. Here’s a screen illustration of HANA Studio showing the 25-node SAP HANA cluster. Now imagine for a moment that you’re using a traditional data center or hosting approach. How long would it take to plan a deployment of this size, including data center space, power requirements, network architecture, and over 70+TB of storage, and to subsequently wait for the delivery, racking and stacking, and provisioning of storage for your deployment? At a minimum, you’d be looking at weeks, or, more likely, months. In contrast, on AWS, the setup of the infrastructure supporting this massive SAP HANA deployment took us a single day, primarily automated by the AWS Quick Start for SAP HANA. Customers often tell us how difficult budgeting and capital expenditure exercises are for on-premises and other co-location type deployment models. In a world where competition means that business must move fast, this is something they can’t afford, so they often either delay projects or overbuy capacity to last for the next 3-5 years. With the AWS Cloud, customers can start with what they need and scale at a moment’s notice to support changing demands. And even these extremely large SAP HANA deployments can be provisioned and paid for on demand, without long-term commitments, allowing customers to move faster than ever before. Review the Lockheed Martin Case Study for an example of a customer who is moving faster while controlling costs with SAP HANA on X1 instances. Additional case studies across a wide variety of SAP workload types are available on our SAP and AWS website. X1 instances are available worldwide in the following AWS Regions: US East (N. Virginia), US East (Ohio), US West (Oregon), GovCloud (US), China (Beijing), Asia Pacific (Mumbai), Asia Pacific (Seoul), Asia Pacific (Singapore), Asia Pacific (Sydney), Asia Pacific (Tokyo), Canada (Central), Europe (Frankfurt), Europe (Ireland), Europe (London), and South America (São Paulo). You can deploy your own production-ready, single-node SAP HANA or scale-out SAP HANA solution on X1 and X1e using our recently updated AWS Quick Start Reference Deployment for SAP HANA with well-tested configurations. Be sure to also review our SAP HANA Operations Guide for other guidance and best practices when planning your SAP HANA implementation on AWS. Last but not least, we are here to help. We have found that a critical key to successfully deploying scale-out clusters of this size require an in-depth understanding of data structure requirements as well as access patterns of your application. This, in turn, drives the correct strategy around SAP HANA table partitioning and distribution. Contact us for assistance in planning and architecture guidance. AWS has a long-standing relationship with SAP where together we are focused on optimizing business outcomes and reducing risk for our mutual customers as they move to the cloud. You can read a blog post by Daniel Schneiss, SVP, SAP HANA Platform & Databases, on the SAP website, where he outlines some of our most recent and future planned collaboration areas. For those of you heading to Las Vegas for our annual AWS re:Invent conference, we look forward to meeting with you soon. If you’re unable to make it in person, make sure to register for the AWS re:Invent Live Streams. Configuration: 25 HANA servers (1 Master + 24 Workers) running on 25 Amazon EC2 x1.32xlarge instances (128 virtual CPUs, 1,952 GB main memory each) deployed in the AWS Cloud. For more details, see: http://global.sap.com/campaigns/benchmark/index.epx and http://global.sap.com/campaigns/benchmark/appbm_cloud_awareness.epx.